Located east of the Anacostia River, Wayne Place is a transitional housing facility for young adults who grew up in the foster care system. 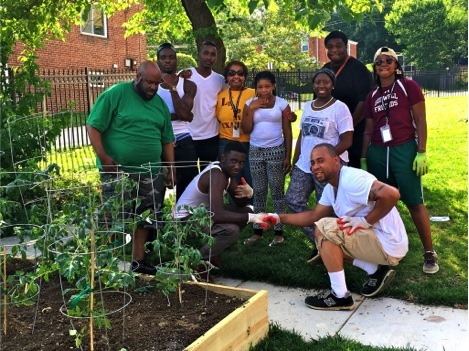 In the spring of 2016, Wayne Place residents and staff from the 11th Street Bridge Park project and the UDC began work on a community garden in an underused area adjacent to the apartments with goals of offering residents the opportunity to participate in growing their own food, saving money on produce, building social capital, expressing their creativity, and providing horticulture therapy (the attempted remediation of health conditions through the act of gardening). We first had to determine—for this location—the design and programming best suited for building a socially and economically empowering urban food hub. Urban food hubs are high efficiency food production sites that utilize bio-intensive, aquaponic, and hydroponic food production methods. Co-located within these urban food production sites are commercial kitchens that serve as business incubators and training facilities for food processing and nutritional health-related activities, and a mobile food truck focused on food equity and distribution of healthy food and education. Given their location in urban neighborhoods, hubs also focus on waste reduction and reuse through composting, water management, and related approaches to minimizing pressure on urban land and infrastructure systems. As such, the partnering organizations facilitated three on-site planning meetings with the Wayne Place community. This was a critical step to getting the project off the ground and establishing buy-in for the garden’s maintenance. Input was gathered on the garden’s design, the types of food to grow and its distribution, and how the space would be used as a peaceful respite to residents’ busy lives. Some of the vegetables residents chose included basil, collard and mustard greens, lettuce, and watermelons—for reasons of taste preference as well as a nod to their cultural heritage. Suggestions to grow vegetables that some didn’t like even spurred conversations surrounding stigma and pain, and some noted their lack of experience with eating fresh fruits and vegetables. Once construction finished, we segued into weekly urban agriculture training classes, and the more that food started to appear from the soil, the more engaged residents became. Once harvesting began, cooking demonstrations were used to pair garden crops with health and nutrition education offered by UDC. In these classes, residents told stories about food and shared personal accounts. They explained what the garden meant to them and how they would use this training to tackle chronic disease prevention, economic empowerment, and exploration of new foods. In one experience, the idea of “farm to table” became real for residents when after a fishing expedition, they harvested mustard greens to cook with the fish they’d caught. As food was growing, so were the experiences of these individuals and the relationships they had with one another. To design a project that included so many trans-disciplinary goals, it was necessary to configure a larger partnership between several nonprofits, which included Far Southeast Family Strengthening Collaborative, ArtReach at THEARC, the Center for Sustainable Development and Resilience at UDC, and the 11th Street Bridge Park. The partnership brought multiple areas of expertise to the project, allowing us to capture a broad range of interests and users. As the technical partner on the project, UDC is committed to fostering growth through education, training, and capacity building so that these entities are ultimately self-sustaining. 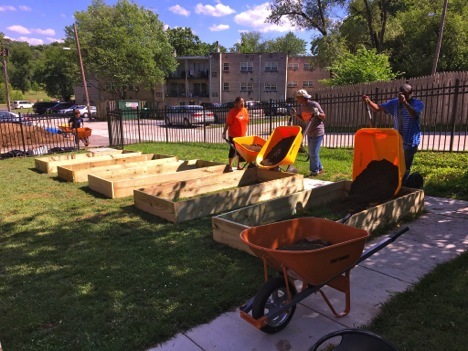 Community relationships took shape during the build and fill day at the garden and was continuously developed through engagement and complementary programming such as art workshops, harvesting events, food truck tastings, training courses, and garden parties. 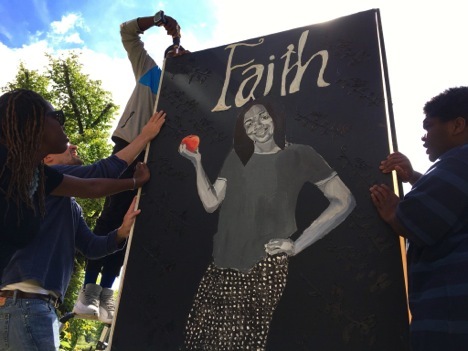 Residents participated in a series of art workshops on site to create a portrait piece that would serve as the backdrop for the garden and a nutrition education. Also layered into the hub at Wayne Place were nutrition, environment, and economic education that included healthy cooking classes, which are co-located between Wayne Place and another Bridge Park Plot with kitchen access. (Our next blog post will detail some of the unique environments at our four Bridge Park Plot sites, including art projects created by residents and congregants that focus on challenges faced by new urban farmers and lessons learned for future urban farm projects.) Far Southeast staff helped market events and training classes through flyers and other marketing material. Resident engagement is continuous and new relationships and ideas are developing as veggies are harvested, art is created, and healthy living concepts become part of day-to-day living—creating a more resilient community.